Paksiw is one of my favorite Filipino dishes; it's got that flavor that bites, thanks to the suka (vinegar). I love pouring its sauce over hot, steaming rice. Best eaten using bare hands! The bangus (milkfish) especially calls for industriously removing its many fishbones, so working with your hands is best. Clean the milkfish of its innards. Do not remove the scales. Chop into three pieces. Place the garlic and ginger into the pot. Add the milkfish. Next, place the sili and the ground black pepper. Pour in the vinegar. For this paksiw, we used sugarcane vinegar (the white one). You can use other vinegars though. The measurement may be different, depending on how strong the vinegar is. Next, pour in the water which should submerge the fish about halfway. Cover the pot, turn on stove to medium-high flame, and let simmer. 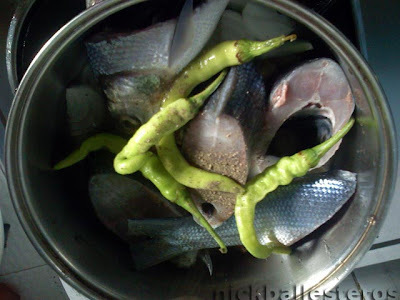 Let the milkfish cook (that's about 10-15 minutes) and then it's ready to serve! Thess: Thank you for dropping by! 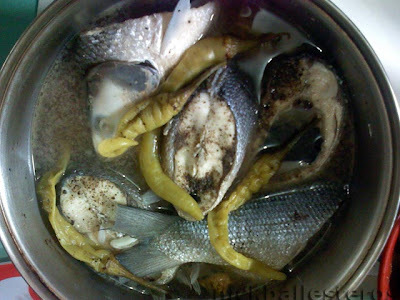 Sarap talaga ng paksiw na bangus! Join, Food for Which My City/Town is known for. Mirage2g: Sarap di ba? Wait, check ko link mo. My hubby likes it. My parents like it too but I don't know why I haven't developed the same fondness for paksiw na bangus.